All manufacturers/suppliers diss the others, who'd want to buy from someone who didn't think their product was in some way better? It's far more important to find the bike that matches your cycling than some of the design options. The huge Thorn advantage if you're dropping that sort of money is the 100 day trial, you don't have to accept what it says in the mega catalogue, you can try it for yourself. I'm on my second Thorn Rohloff frame, both have been good buys, I'd rather some things had been different but they've been closer to my ideal than anything else available. I could have gone custom but would have lost some of the Thorn advantage of volume production. Some things haven't matched the sales pitch, but then I never expected them to. Advice and after sales service have always been first class. Which isn't always matched by other manufacturers however much money you spend. I live in USA so I really have no opinion on what different retailers in the UK or Europe say about each other. While Thorn might be a bit late to the party when it comes to disc brakes on forks, belt drives, etc., that does not bother me at all. This past spring I built up a new bike and put on a square taper crank (technology from decades ago), eight speed cassette and bar end shifters (technology from decades ago), I wanted a steel axle Shimano rear hub instead of one of the newer Aluminum axle hubs (technology from decades ago), Brooks saddle (technology from a century ago). I did use a newer design disc rear brake, but the frame was designed for disc only so my choice was limited to choice of disc brakes. And I used a dyno hub because I have lots of electronic toys to keep me busy. My point is that if you want the latest marketing fad, there are lots of people that will sell it to you. But for a touring bike I want something that is robust, reliable, and easily repairable/replaceable (which includes obtaining parts). Parts that have a long history of meeting my criteria are more important to me that parts that are of new design. You don't have to name the other party to be critical of their design choices - X is the only way to do Y and doing it Z is wrong - can be read on many a website either side of the pond. My experience is there's rarely only one way to do anything and pros and cons to them all. My point was that a good deal of the sales blurb can be taken with a pinch of salt, both that extolling the virtues of their choices or criticising those of others. You may prefer one type of brake over another, or different shifters and it's good to find a supplier who can accommodate that. But the things that decide if I like a bike or not are the fundamentals like seat tube angle, BB drop, reach and trail. My choice of new frame came down to a Mercury or another, despite the other having my preferred brakes and gear changer, the Mercury won because I know the geometry works for me. Regardless of how many zillion words are in the mega brochure, for someone who hasn't had a similar bike before the only way to know if it's right is to ride it. The opportunity for a UK rider to do so on a Thorn for 100 days is IMO a bigger advantage than some of the things waxed lyrical about that I consider pretty peripheral. Janet if you are go for the new tiagra groupsetits fantastic never misses a beat and 11to34rear you'll be set for any hill. Each has disadvantages and advantages. 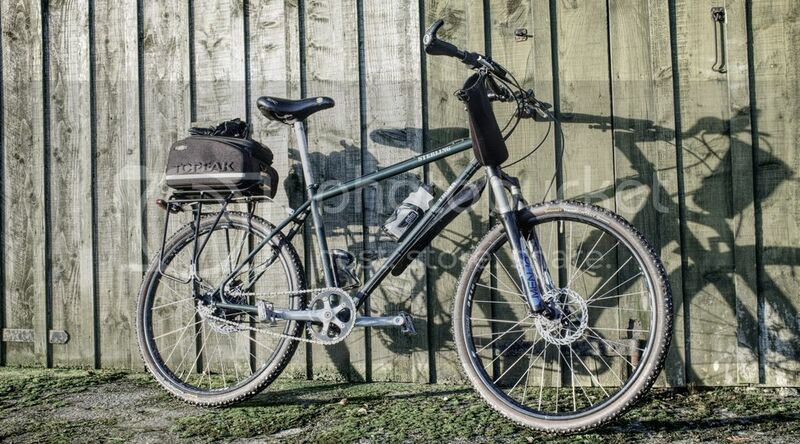 I am quite happy with my Nomad (Rohloff) and my Sherpa (derailleur), plus several others. • My derailleur drivetrains are all older 5-, 6-, and 7-sp with one 9-sp. The older, thicker chainrings, cogs and chains last a phenomenally long time while the 9-sp wears out much more quickly. Used exclusively, I can burn through several complete 9-sp drivetrains in a 4-months long summer (chain, most-used chainring and most-used cogs, meaning a whole new cassette). Not all of it is due to the narrower width: All the older drivetrains are half-step and granny with the most used combos having little or no chainline deflection. All are reliably friction-shifted. The two indexed models have a friction option and do well either way. The indexed 9-sp has crossover gearing so is subject to more chainline variance, though I take care to use chain-aligned combos and end up with about 14 usable gears, close to the Rohloff. It shifts beautifully in indexed mode, as quickly and quietly as my Rohloff. It does okay friction-shifted, but the gaps are a little tight to shift as cleanly as my older stuff. • The Rohloff is the ticket for me on long tours and requires no real maintenance at all, barring periodic oil changes and a chain retensioning on really long tours. Most ideal for me in extreme environments (i.e. desert dust, mud, snow/ice). It is also very nice to be able to shift while at rest so a lower gear is pre-selected when stopped on a hill with a fully loaded bike. Both good but in different ways and each with their own pluses and minuses, as George said. For me, the main advantages of (most) hub gears are low maintenance and very long service life. Disadvantages were limited gear range and less than ideal gear steps, perhaps reduced efficiency (but I am a bit sceptical about that in real-life use). Rohloff solves the gear range and gear steps issue for me. Shimano 8 is good enough for most of my riding, but not quite sufficient for loaded touring in hilly areas. Chainglider reduces drivetrain maintenance still further, particularly useful when doing survey work on paths and tracks. While doing intensive survey work I used to spend 1 to 2 hours a week on bike maintenance cleaning the bike and replacing chains and sprockets. With hub gear and chainglider this is much less and mainly limited to regular changing of the rim-brake pads. Before getting a Rohloff, from 1972 to 2012 I used hub gears for somewhere around half my mileage, mainly Sturmey-Archer 5-speed hubs from the 1970's and early 1980's. Hub gears mainly for all weather commuting, other utility rides, local off-road riding. Derailleurs for tours in hilly areas, fun rides in good weather, some commuting in good weather. From 2001 I added Bromptons (hub gears, but with a tensioner, so more like a derailleur for maintenance) which I use when combining bikes with other transport. I'm in Rothesay. If you and your partner want to come over and take the bikes for a spin you'd be welcome. I'm over in Aberdeen but sometimes get across to the (wet!) West coast. Ha! Tis indeed wet here on the Isle of Bute. Was out today and where the road bends at Ettrick Bay South, the sea had washed across it through the night leaving sand and pebbles from gutter to gutter. The upside was that I saw only two vehicles on an 8-mile stretch of 'main road'. Such a generous offer, thank you very much. If we do decide to take you up on the offer, I will let you know. One more thought. SJS and Thorn have established maximum tire pressure recommendations to avoid rim damage. Ask them about that when you go shopping. Their recommendations have changed over time which is one reason that I am not citing them. Some rim manufacturers have maximum pressure ratings on the rims, but the Ryde rims that I got from SJS did not have any rating printed on them.